If you have a large laundry room with loads of workspace and storage options, count yourself lucky! 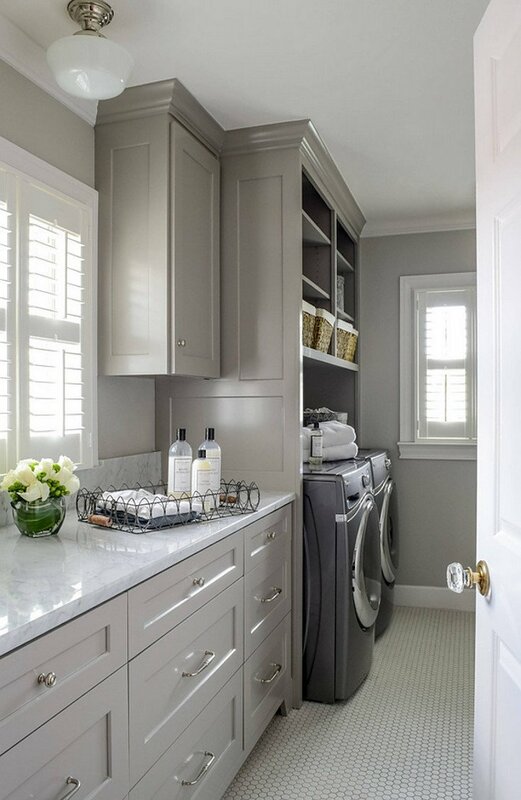 Not everyone has the luxury of a spacious laundry area; often laundry “rooms” are tucked into closets, corners, or wherever a few feet of space aren’t being used, and that can make storage and organization a bit challenging at times. 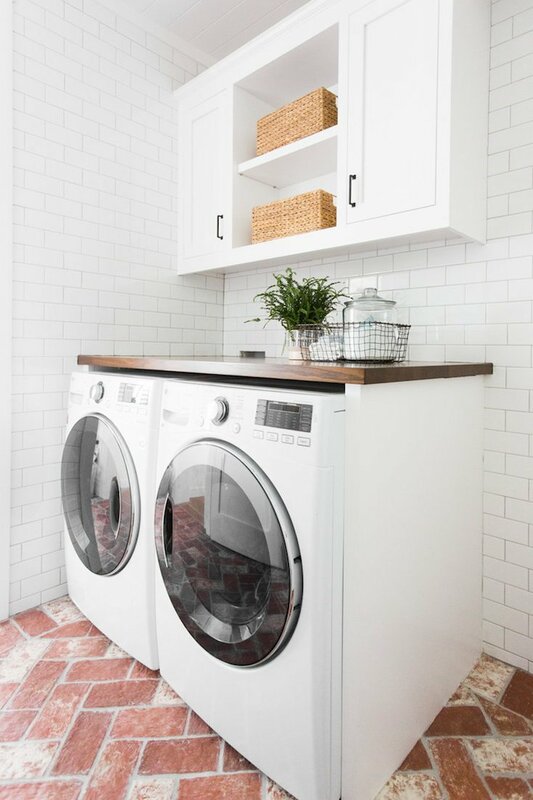 Today we’re sharing some creative and inspiring laundry rooms plus shopping links at the end of the post for making the most of the space you have to sort, wash, dry, and fold. If you have a tiny laundry room, you’re not alone. Many homes have laundry closets, corners, or simply areas in the kitchen or bathroom. 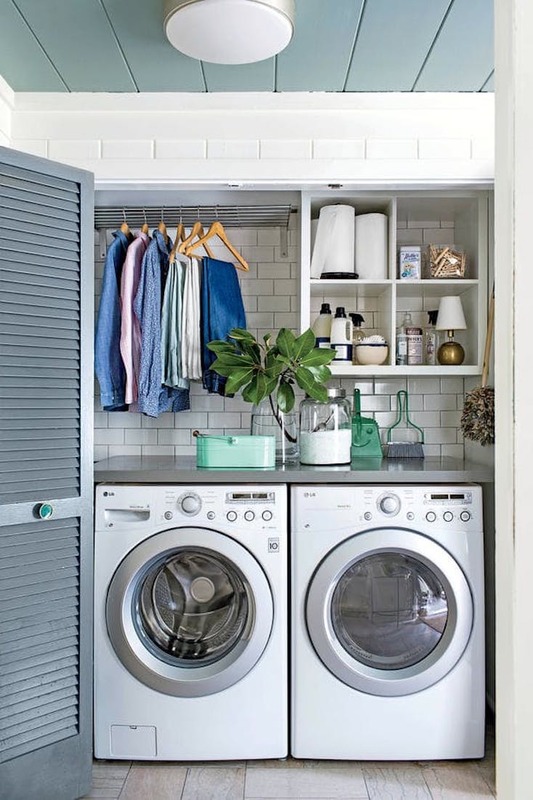 If your laundry space is on the small side, you might be able to incorporate some ideas from these diminutive laundry spaces. This laundry closet is as pretty as it is functional, with open shelving, a hanging bar, and a machine-top counter space. 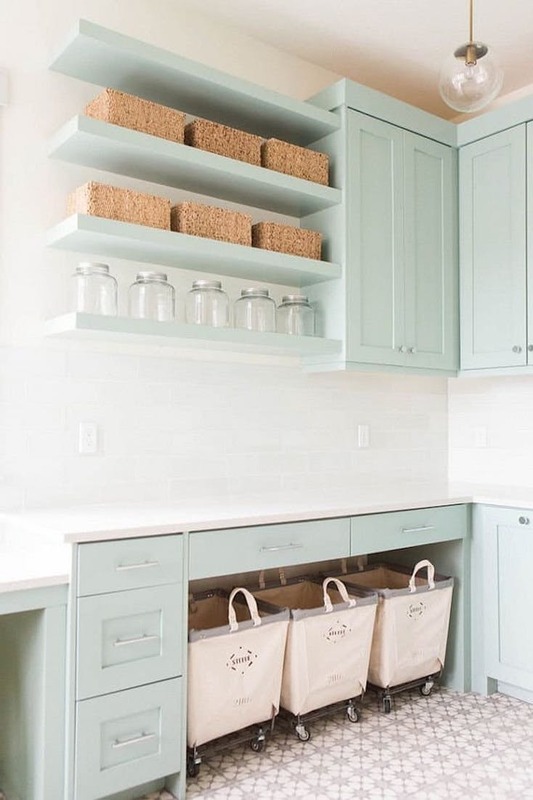 A chic glass jar houses the laundry detergent, and a green bucket adds color as well as extra storage. 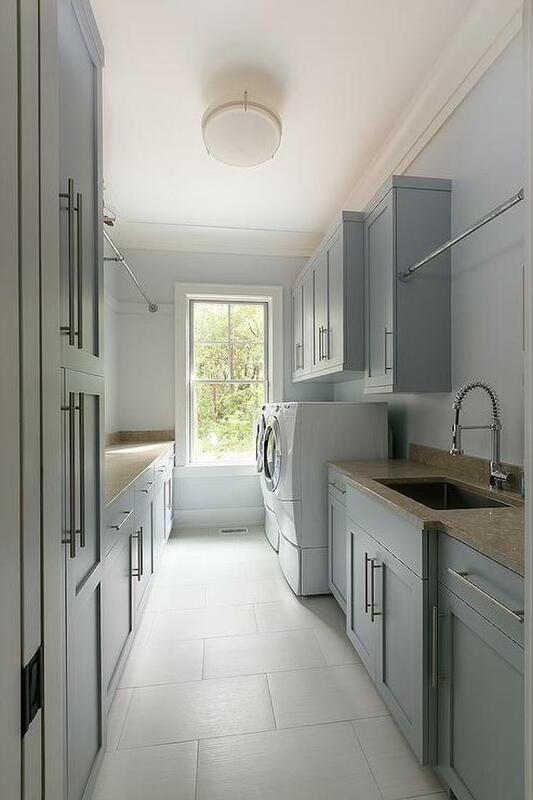 This laundry closet has doors, but I don’t know that I’d want to close off this stylish space. Two upper cabinets offer storage and bookend a hanging bar, and just look at that great backsplash! 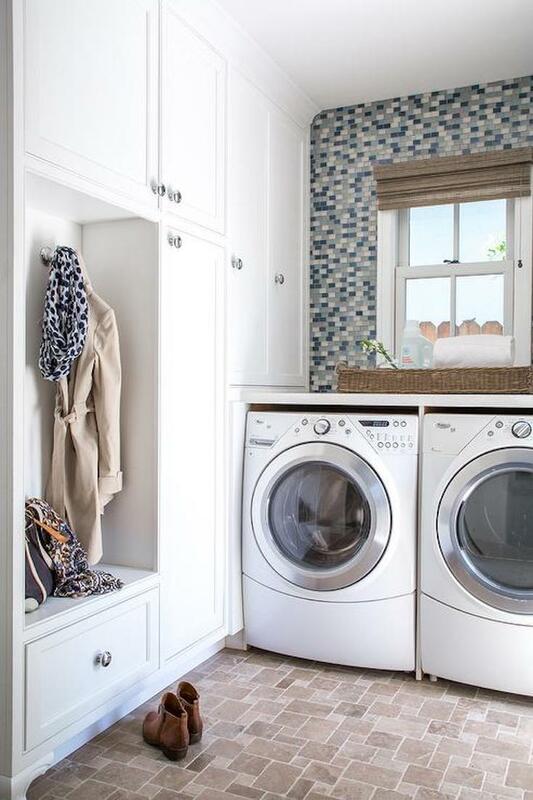 This light and bright laundry room might make me want to do laundry. Stacking the machines gives you more space and makes room for a small sink as well as lots of cabinet storage. Also, check out that fun ostrich wallpaper! The design of this lovely laundry area is so smart, with a lot of open shelving for a space this size and still room for a hanging bar. Handy baskets, colorful bowls, and pretty glass jars offer more small storage. 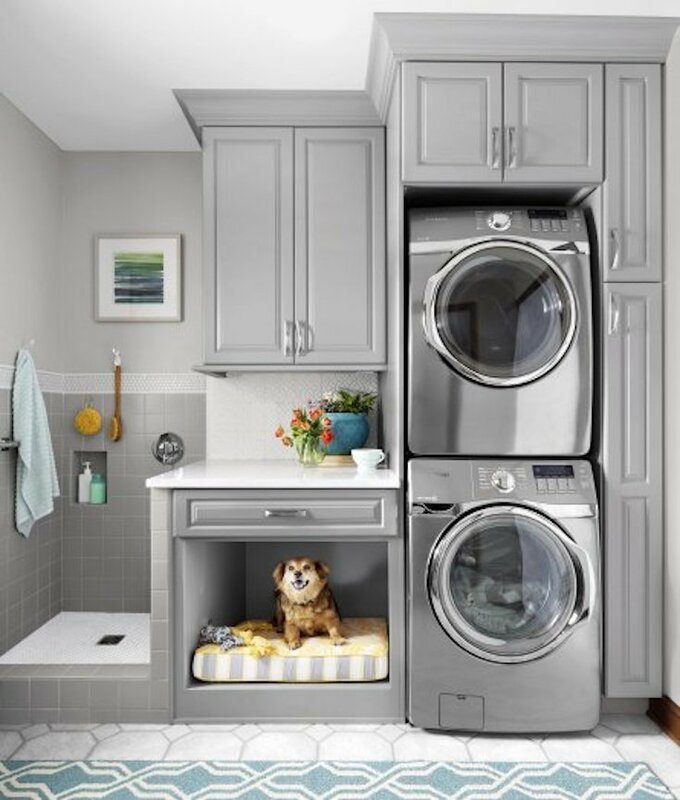 This gorgeous space combines laundry and pet care and still offers lots of storage. Stacking the machines allows for room for a dog den as well as a pup-cleanup area. Just because your laundry is in a corner, doesn’t mean it can’t be attractive, as this space shows. The brick floor, wood countertop, and pretty baskets warm up this otherwise clean, white space. Here’s another laundry corner that makes great use of the space. Keeping the machines on one wall allows for a full wall of locker-style cabinets and even a mudroom-like bench for coats, bags, and shoes. If you’re like me, you spend quite a bit of time doing laundry. (Where does it all come from?) 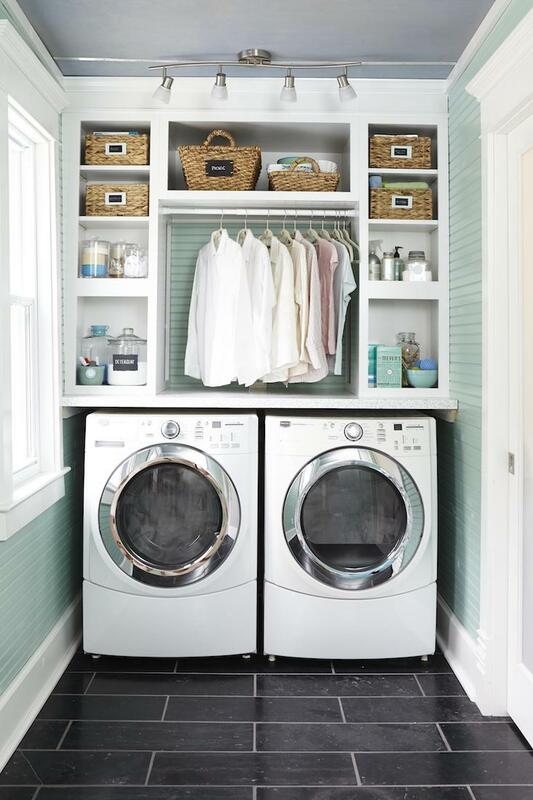 So a large, luxurious laundry room like one of these would be heavenly. 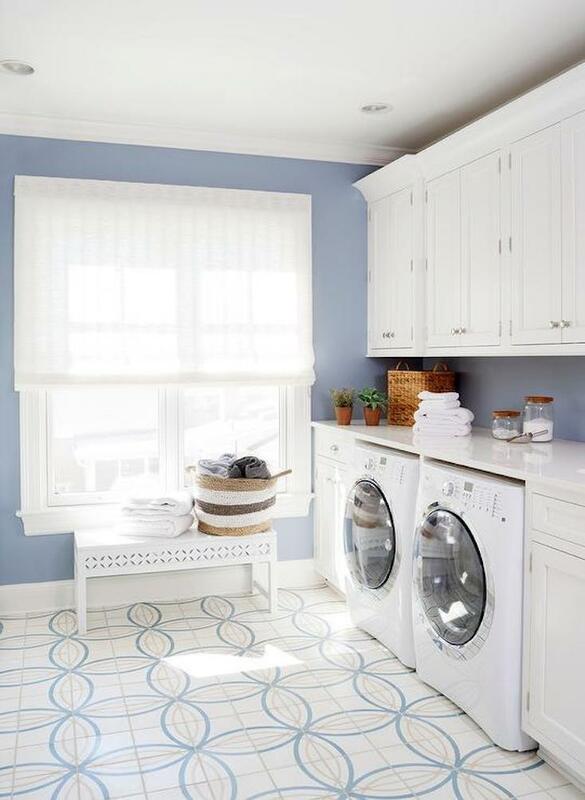 This blue and white laundry room is so happy and cheerful. It offers tons of counter space as well as closed storage to keep the space free of clutter. 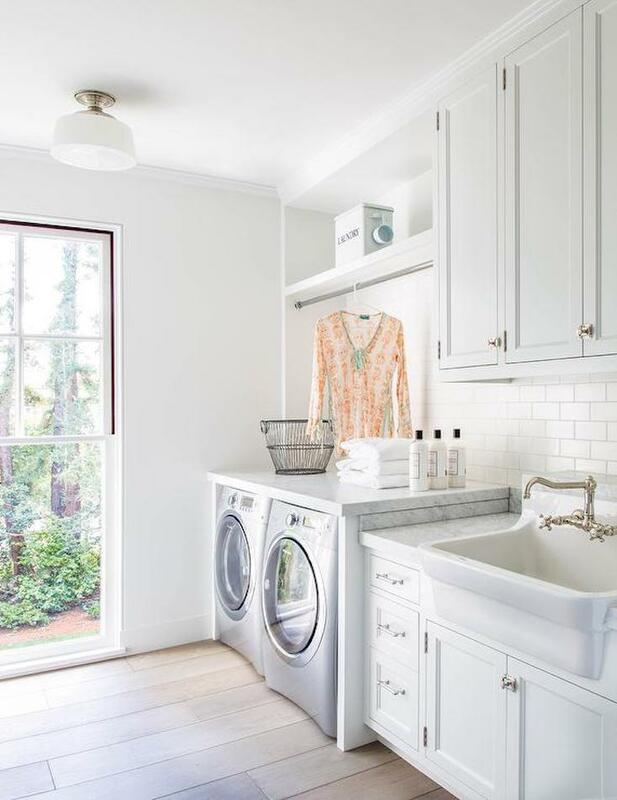 Here’s another bright and gorgeous laundry space. The overhead cabinets stretch to the ceiling for extra storage, and the deep farmhouse sink is a wonderful bonus. 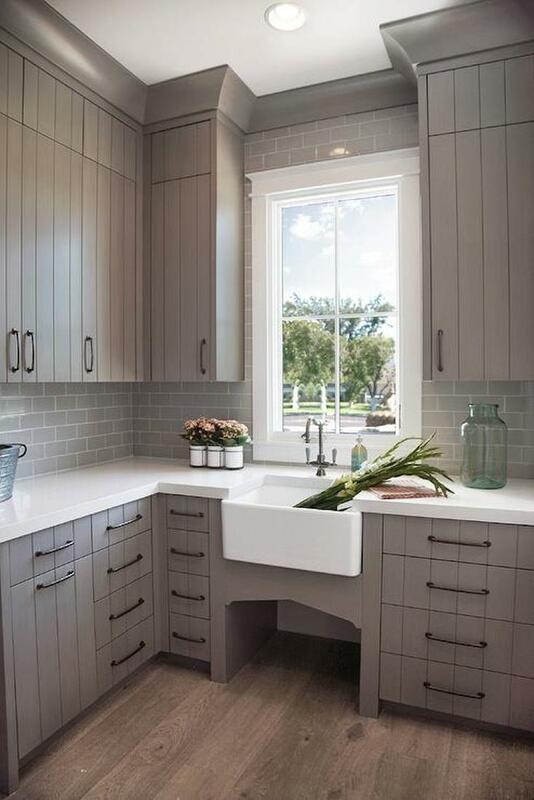 With multiple drawers, cabinets and shelving that stretch to the ceiling, and lots of counter space, I almost wonder what I’d do with all the storage available in this chic galley laundry room. I love the color of the built-ins in this serene laundry room. The combination of cabinets and open shelving allows for a pretty display of baskets and jars, and providing a dedicated space for laundry tubs below the counter means you’ll always have a tidy space. 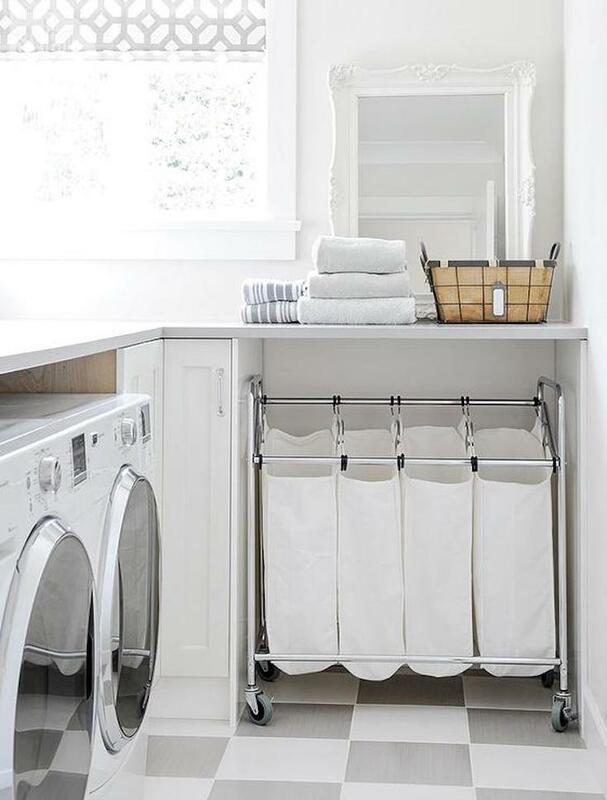 This long laundry room checks off just about every item on my laundry room wish list: so much closed storage, multiple hanging bars, yards of counter space, and a large laundry sink. The layout of this laundry room offers a great corner area of custom cabinetry, counter space, and even a farmhouse sink. No matter what size or style laundry room/closet/corner/space you have, you can get creative in how you approach it. 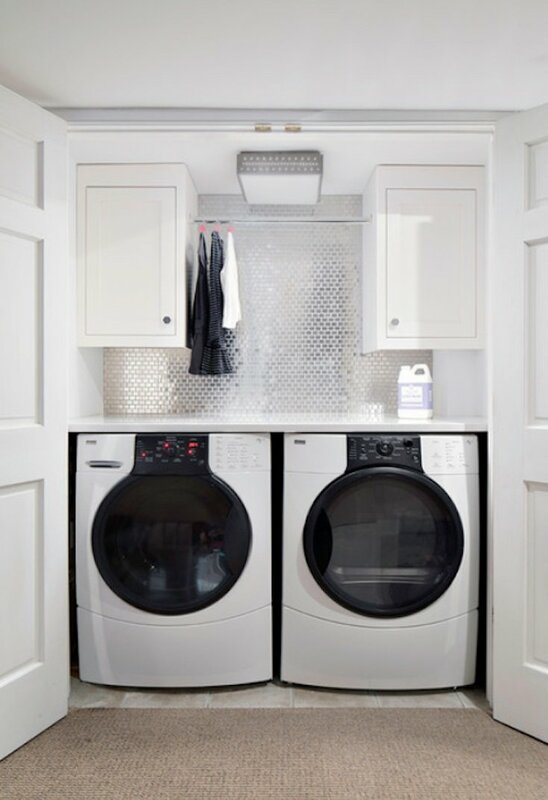 In addition to some of the ideas and products highlighted, here are a few more ways you can make your laundry room your own. Wallpaper is an easy way to dress up a laundry room of any size. 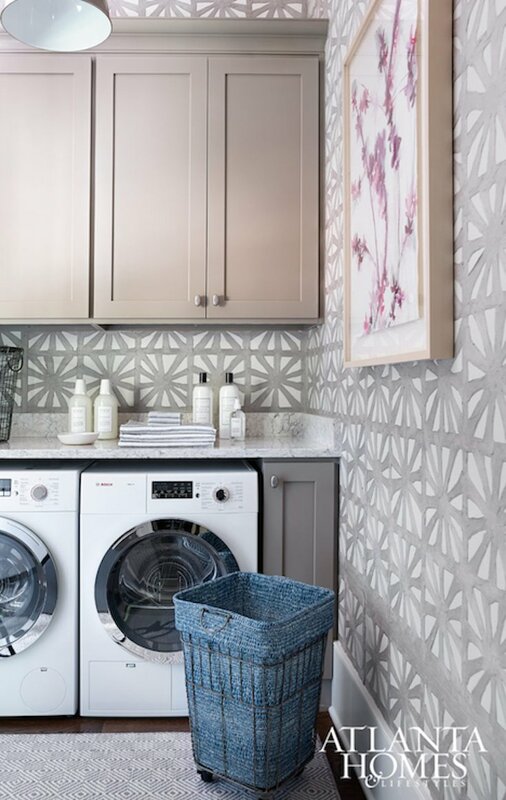 This gorgeous gray and white wallpaper makes this laundry room feel much more welcoming. This four-bin laundry sorter on wheels is a great way to collect, sort, and manage laundry. And it’s just the right size to fit under a counter. You can’t dry everything in your machine, and sometimes drying racks take up so much space. 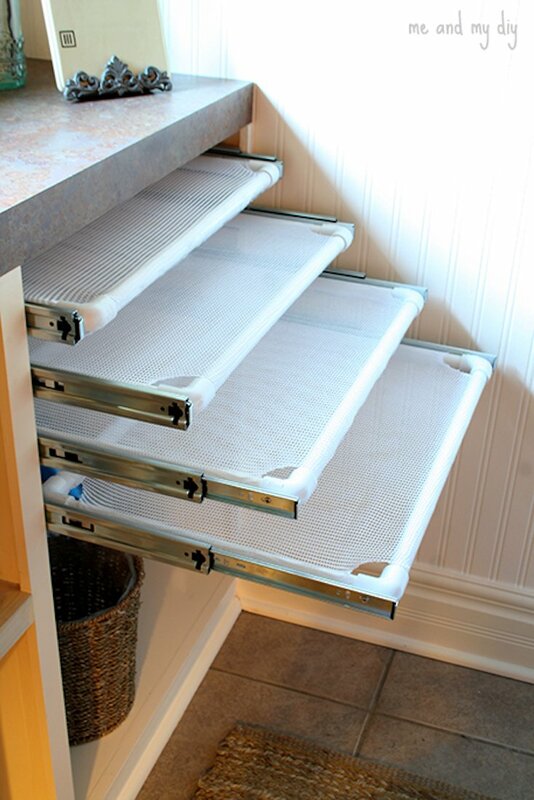 Create your own built-in drying racks using mesh laundry bags, PVC pipes, and drawer slides. Click through for the easy tutorial. 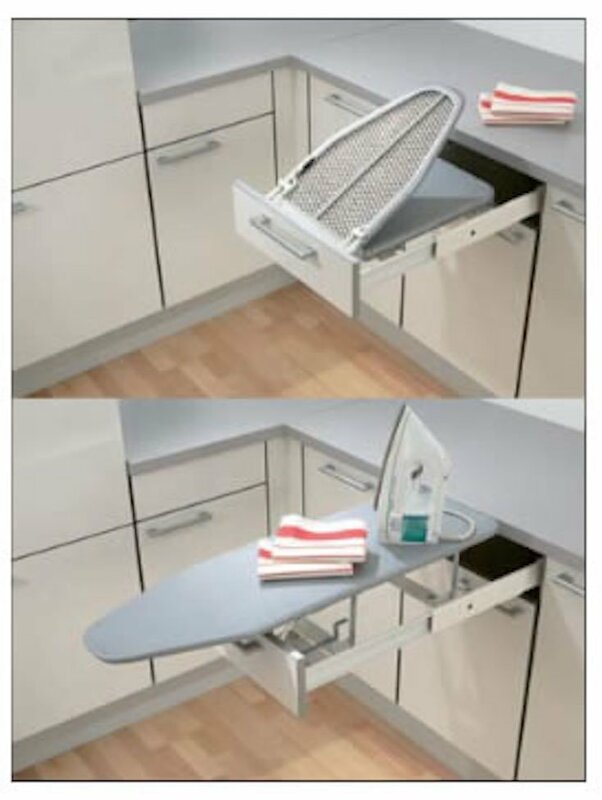 This fold-out ironing board in a drawer is a fantastic space saver. When you want to iron, pull it out. When you’re finished, it folds away quickly and easily. 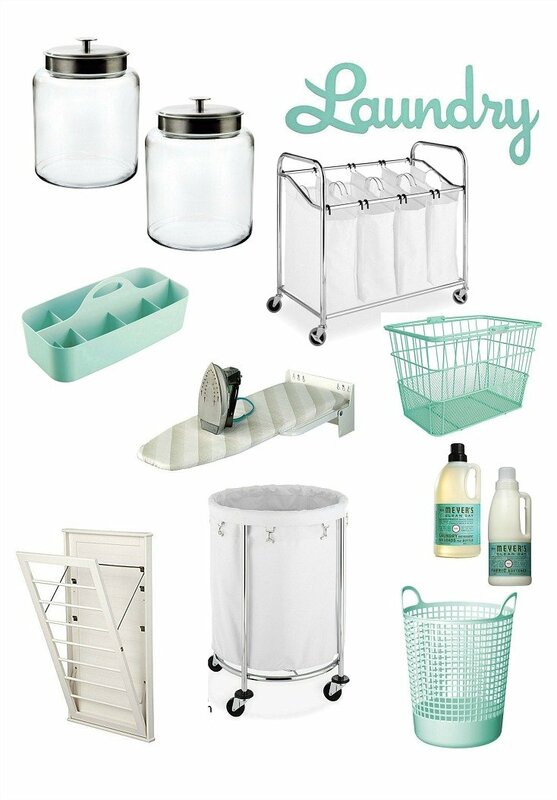 Here are a few of our favorite laundry accessories, products and storage pieces. 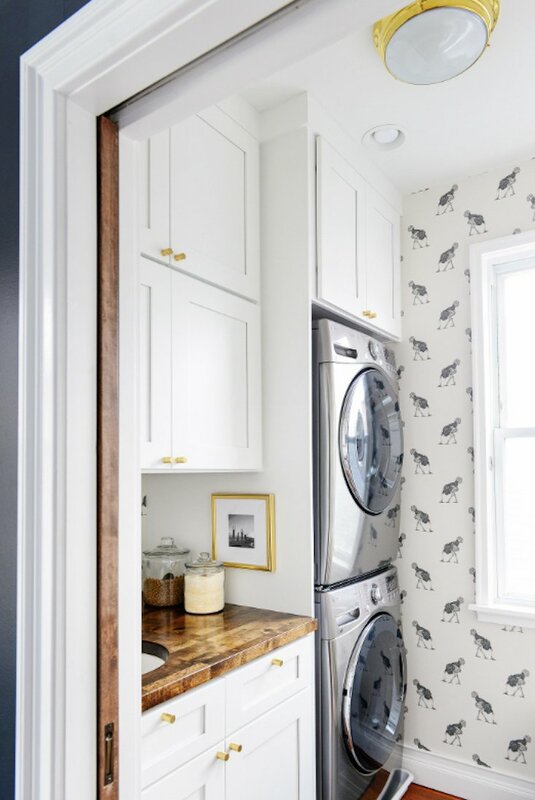 Whether your laundry room is small or large, we hope some of these creative and inspiring laundry rooms encourage you to make whatever-size space you have one where you’ll actually enjoy doing laundry! I have a large laundry room with a large crank out window with a beautiful view of the pool and backyard. I have cream colored cabinets on one wall , large porcelain sink and brown speckled granite counters. I would like to paint 3 of the walls a chocolate brown and the one across from the cabinets a cream color and then put a cowhide rug over the tile. Will this combination close in my room or warm it up? It is currently a light blue. Hmmm.. If the laundry room is really large, it would certainly make it more cozy. The combination sounds so pretty, especially with the cowhide rug in the mix! If you’re afraid it will look too small, what about a fun brown and white wallpaper or patterned grasscloth? small laundry rooms or laundry corners? I should be so lucky. my washer and dryer are in an unfinished part of my basement next to exposed pipes and under ductwork. try decorating around that.